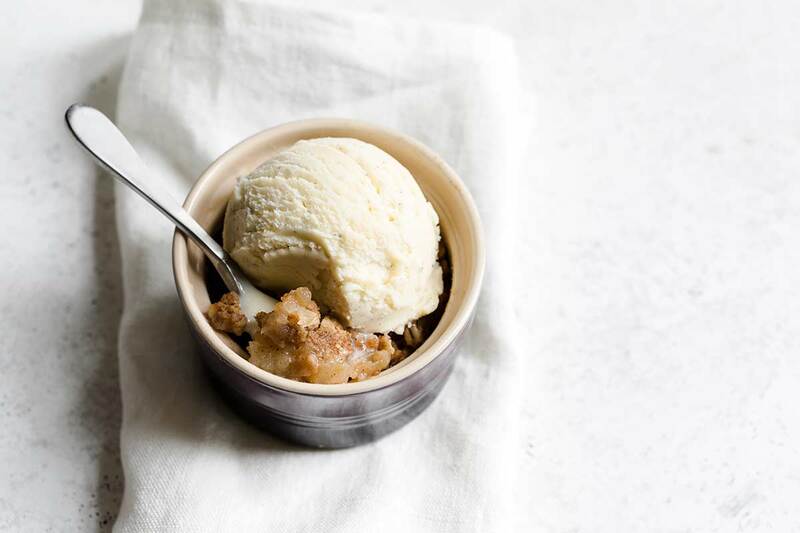 This apple crumble recipe is the easiest dessert, with only a few simple ingredients. 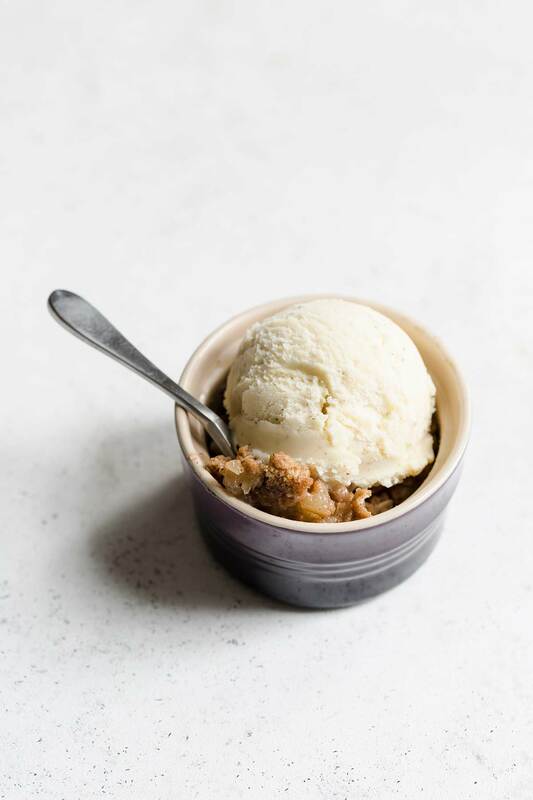 Juicy apples are covered in a sweet, streusel-like topping and then baked in single serving ramekins for a perfectly portioned treat. This apple crumble is perfect for serving guests, a romantic dinner for two, or any special occasion. Like most of us, I love a good Thanksgiving feast. Imagine my frustration over having to skip not one but two Thanksgivings in a row due to bad head colds. I almost never get sick, yet somehow I managed to catch something twice just in time for the very best holiday meal. It was beyond annoying. We had to cancel our plans at the last moment, but I felt like we still deserved some sort of Thanksgiving meal, so I managed to whip up a small holiday dinner for two. I didn’t have a lot of energy to prepare an elaborate dessert, but what I came up with was simple and lovely, especially for just the two of us. I baked an apple crumble, but instead of making one large dessert, I prepared two individual portions. It was just the right amount. I’ve listed tart baking apples such as Granny Smith in the ingredients list because it will definitely give you the best results. They don’t turn to mush in the oven, and the tart flavor balances the sweetness of the sugar. However, you can really get away with using any apple you prefer since this isn’t a big dessert like apple pie. I believe I used honeycrisp apples on Thanksgiving, and neither of us were complaining. I’ve baked these in 7-ounce ramekins (mine are on the pricy side, but you can find much cheaper options if you don’t already own some). The ramekins are extremely hot right out of the oven. If you’re serving children, I recommend transferring the dessert to a different bowl before serving. Alternately, you can bake this in one large dish. A pie dish would work, but you can eye out your various pans and casserole dishes to see what looks right. Keep in mind that the apples only come up about 1 1/2 inches in the ramekins, so you want a shallow dish. If you use a single baking dish, you may need to leave the apple crumble in the oven for an additional 5 minutes or so. 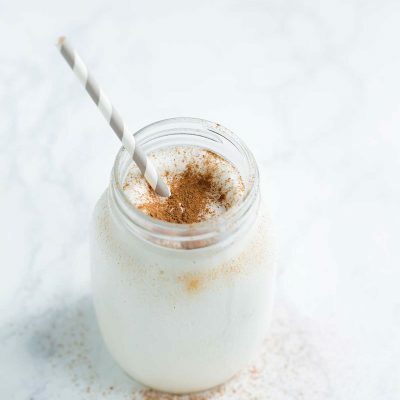 Make this recipe gluten-free by using almond meal (or a gluten-free flour blend) in place of the all-purpose flour, and gluten-free rolled oats. I highly recommend serving this dessert with either vanilla ice cream or a splash of heavy cream. 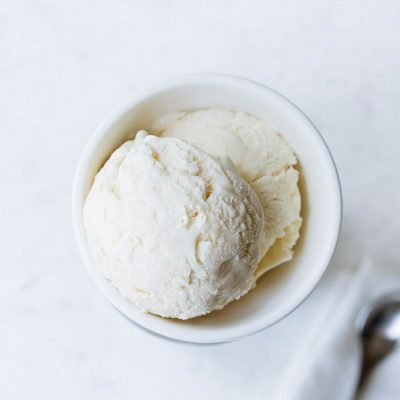 We only had cream on Thanksgiving, and it was almost as good as the ice cream. This is a good option if you prefer less sweet desserts. 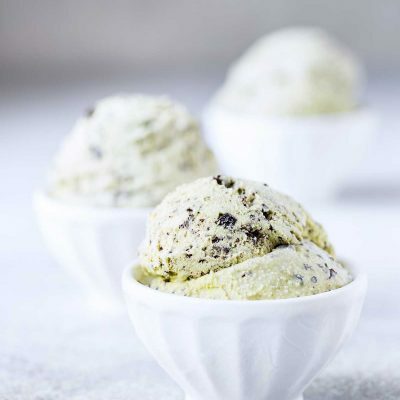 If you like experimenting, try adding 1-2 tablespoons of chopped pecans or almonds to the topping! You can also add some extra spices, like 1/4 teaspoon of freshly grated nutmeg or a pinch of ground cloves. Making a romantic dinner for two? 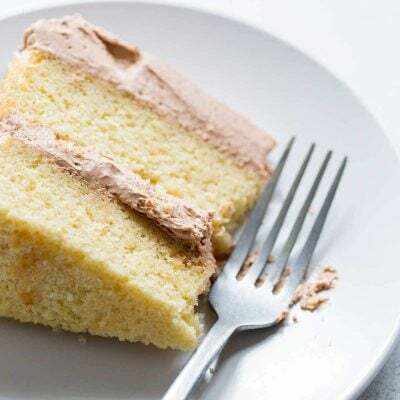 You can easily cut this recipe in half. What’s the Difference Between a Crumble and a Crisp? Crumbles and crisps are almost identical. Both desserts include fresh fruit that is baked with a streusel-like topping. Originally, the difference between these two desserts was in the topping: crisps had oats in the streusel topping and crumbles did not. However, these days the names are used interchangeably. Can You Make Apple Crumble in Advance? You can! 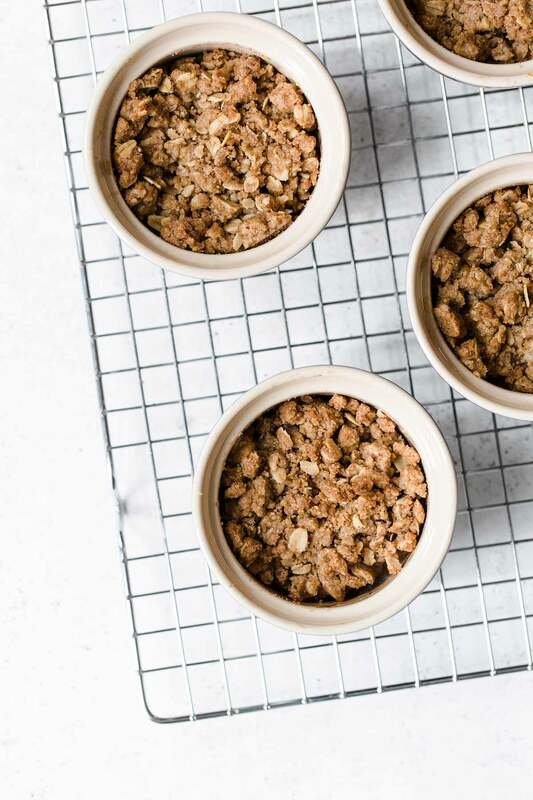 This apple crumble can be assembled, covered and refrigerated for up to 24 hours in advance before baking. Love this apple crumble? You may also like my Apple Chutney, Apple Noodle Kugel, and Apple Pie with Gruyere Crust! I also love this Apple Butter from Baking a Moment. 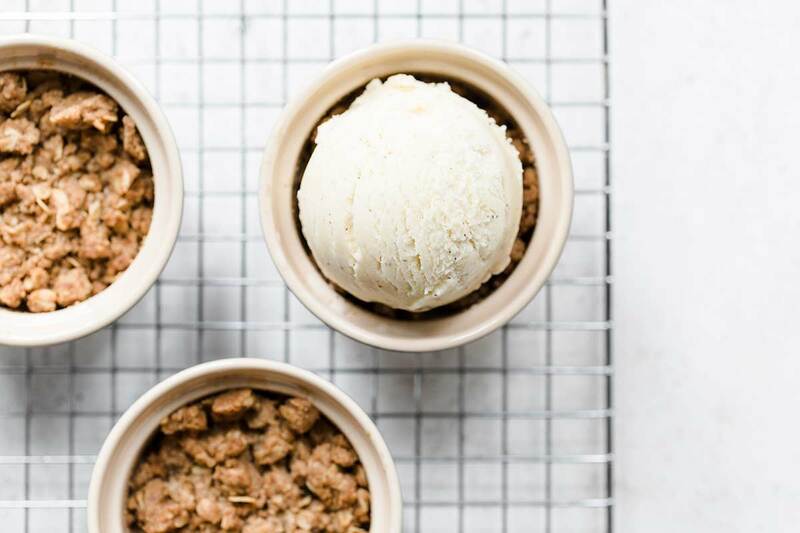 This apple crumble recipe is insanely easy! 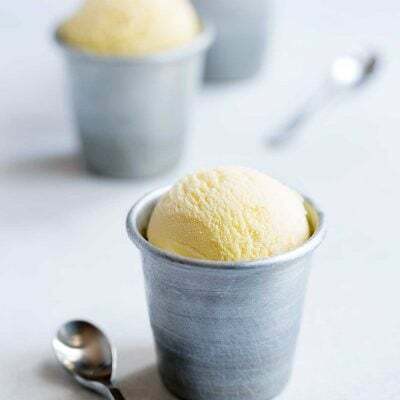 Instead of preparing one large dessert, I’ve used ramekins to create 4 single servings. It creates a beautiful presentation. Prepare the filling: In a medium-sized bowl, combine the apples, sugar, cinnamon and salt, stirring until evenly combined. Prepare the topping: In a separate small bowl, stir together the flour, brown sugar, oats, cinnamon, allspice and salt. Add the melted butter, stirring until evenly combined. Divide the apple mixture between four 7-ounce ramekins. Divide the topping ingredients between the ramekins, spreading evenly over the tops and gently pressing into the filling if there’s any overflow (this will only happen if the apples are very large). Place the ramekins on a baking sheet and place in the oven. Bake for 30 minutes, until the tops are firm and the filling is tender. 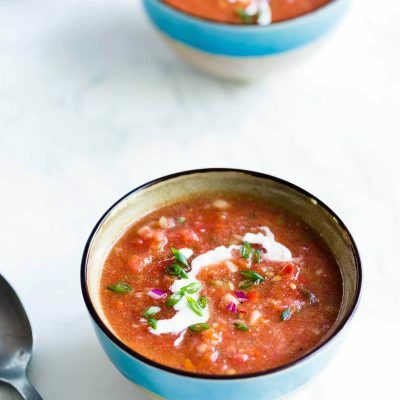 Serve hot, preferably with ice cream or a splash of heavy cream. (Note: the ramekins will be very hot, so be careful. If serving a child, I recommend scooping the apple crumble into a different serving bowl to be safe). Leftovers will keep in the refrigerator for up to one week. 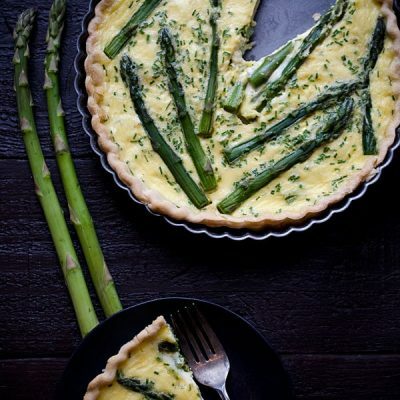 You can bake this in one large dish if you prefer (a pie pan would work well). Please read my post for additional recipe tips! Want to really wow your guests? 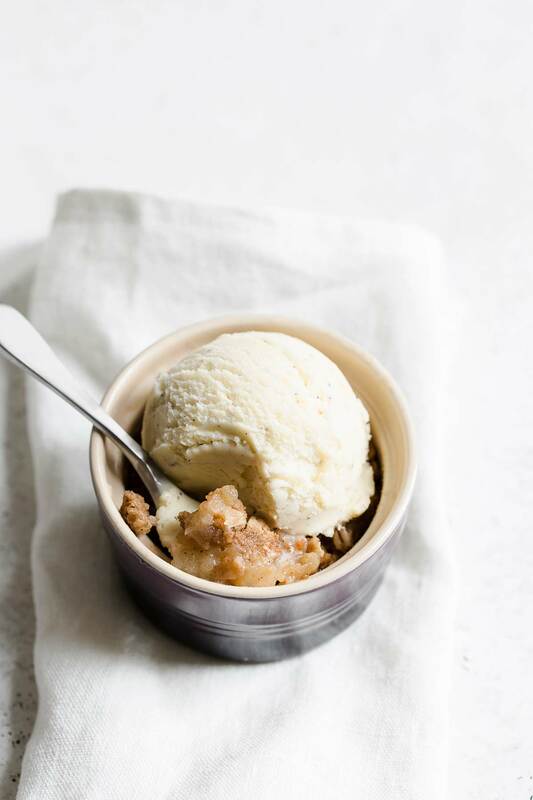 Try serving this apple crumble with my Homemade No-Churn Vanilla Ice Cream! I can’t get enough of this, it’s amazing! My family loves apple desserts, so I can’t wait to try this! 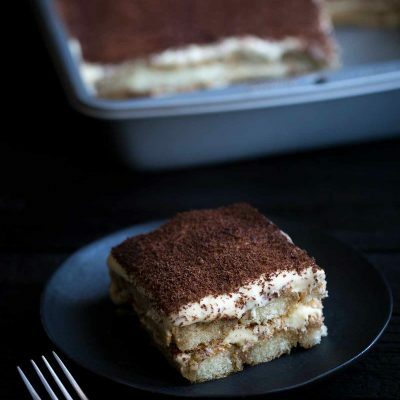 Such an easy yet satisfying dessert. Thanks for sharing. I was searching for individual apple desserts and found your terrific recipe! My dinner guests all wanted the recipe! Such a perfect simple dessert. 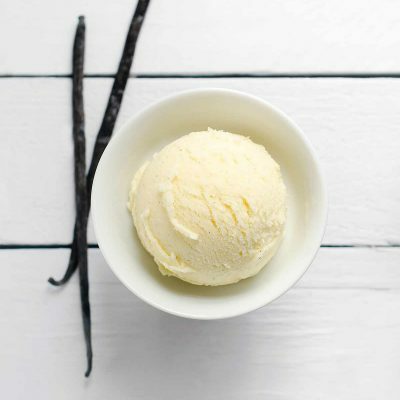 Serve warm with a scoop of vanilla ice cream is just heavenly. I’ll be having 12 for dinner and would like to serve this for dessert but don’t have enough ramekins. Can this be made in a 9 x 13 with the ingredients tripled? Changes to baking time and temp? Hi Paulette! 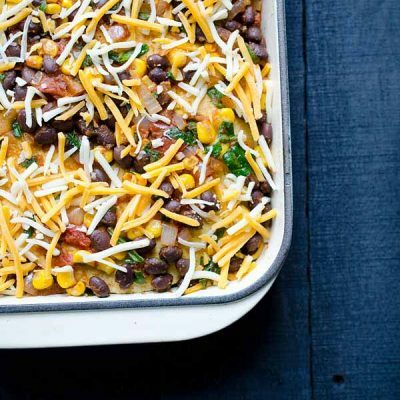 You can definitely scale up this recipe as much as you want and bake it in one pan. A 9×13 pan will probably create a thicker layer of apple filling, so I’d anticipate that will increase the bake time. I’d lower the oven temperature to 325 degrees just to make sure the topping doesn’t get too brown while the filling is cooking, though that might not be necessary. It certainly can’t hurt with this type of dessert. I’m just taking a guess on the bake time, but luckily this type of dessert is hard to overcook as long as the topping doesn’t burn. It will take longer at 325, so I’d start peeking through the oven window with the light on at 35 minutes. My guess is 40 minutes. Thank you! Love your website and all the delicious postings. 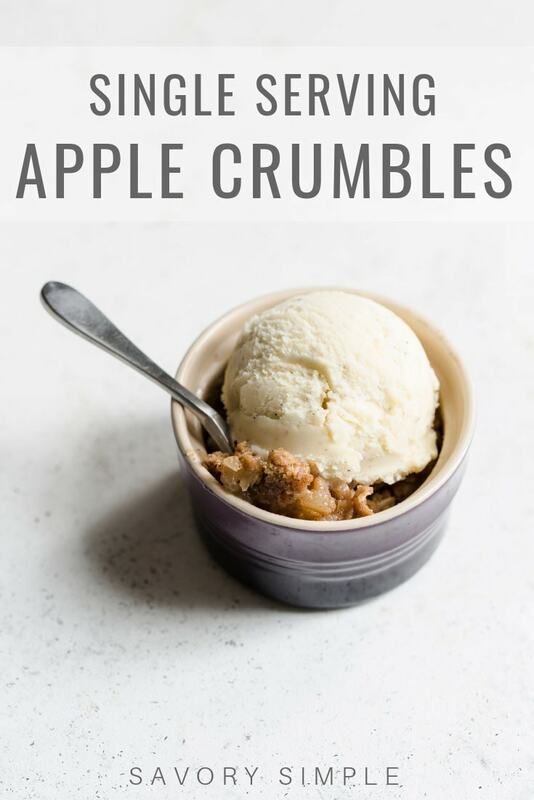 Apple crumbles are some of my favorite desserts. 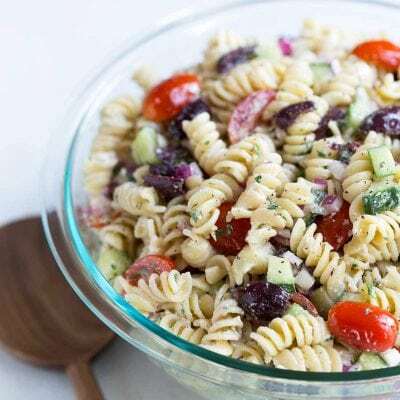 I LOVE the individual portions with this recipe! 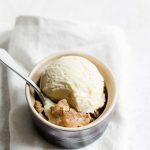 Apple crumble is one of my favorite desserts! My family really loved this! It was so awesome! 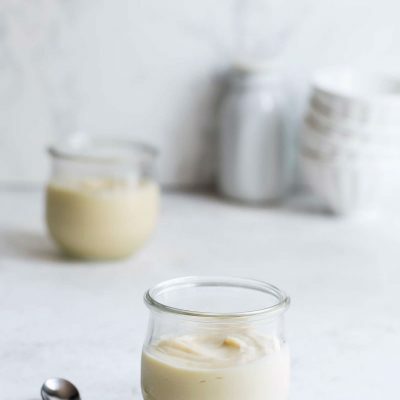 The perfect dessert for a dinner party I recently hosted! The BEST Apple crumble I have ever had! !